Hundreds of fellow Tartans will be working the upcoming job fair as they look to distinguish themselves from other attendees and land their dream job. Kevin Collins, career consultant for the School of Computer Science and assistant director of the Career and Professional Development Center, and Chris Maloney, senior manager at Cisco and Carnegie Mellon alumnus, shared their insights on how to make the best of a career fair. Such questions should be asked further into the applications process, never up front. Something else to avoid: ignorance of the company a recruiter is representing. Failing to do one’s homework beforehand puts one at a huge disadvantage and often annoys the recruiter. Maloney also stressed the importance of doing prior research on the company and how it functions. “Understand the company as a whole ... rather than focusing on specific things like press releases,” Maloney said. He added that simply reading the latest press release from the company was not sufficient. In many cases, the recruiters may not know what is going on in another branch of the company and may not even know about the press release. If the students do not have enough knowledge of what the recruiters have to offer, the students appear unprepared or ill-suited for the job. This may cause recruiters to look to more informed students. A fair number of people are guilty of going to different booths just for the free stuff or “the swag,” as Collins put it. Google may have cool pens, but unless you are interested in a position at the company, it is best to avoid wasting not only your time (and the recruiter’s), but also avoid wasting time for those who are genuinely interested in working for the company. One of the best ways to interact with a recruiter is to think like one, or rather, understand their mission at a job fair. Collins explained that job fairs serve as a way for companies to get a “quick assessment of candidates” and build upon their applicant pools. Collins also stated that job fairs “serve as a way for students to get on the company’s radar and for recruiters to remember them,” building a connection that aids in the application process. One way in which students can hone in on their strengths and make recruiters notice them is by practicing and perfecting the art of a quick pitch, also known as an “elevator speech” or “30-second commercial.” The Job Fair Success Guide located in the Career Center provides detailed examples and a checklist that can be used to perfect your pitch and get across who you are in the shortest time possible. An online version of the Job Fair Success Guide also exists on the website of the Career Center. 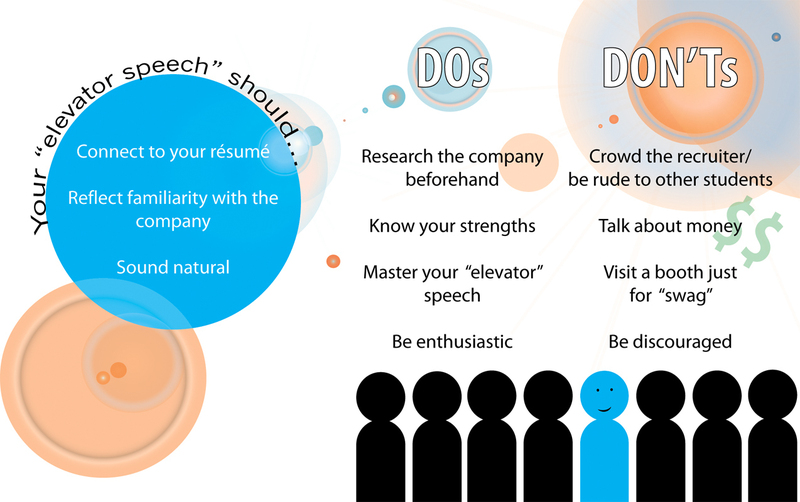 The guide suggests, among other things, that an elevator pitch make connections to the student’s résumé, reflect a familiarity with the company, and sound normal rather than forced (practice is suggested, of course). “It is all about selling yourself and knowing what works best for you,” Collins said. Maloney described some of his most memorable encounters with students who were hired in previous years. In one such case, a student came up to Maloney and explained why working with Cisco was her dream job. She then went on to describe how the work she was doing in college was relevant to the kind of work Cisco was doing. Maloney explained that the student’s knowledge of the company and her enthusiasm were two key factors that helped her get the job. Such realities mean that one should not be discouraged if attending the job fair does not result in employment. By speaking with career counselors like Collins, students can uncover many different opportunities available beyond those present at the fairs. Also, one should remember that each of the fairs has a different audience and appeals to different skill sets. Although Cisco does look for applicants with basic programming skills, Maloney mentioned that the company has recruited a number of non-traditional applicants as well. In the past, Cisco has recruited students ranging from first-years to graduates, as well as students who are not enrolled in traditional technical programs, such as biology majors. “They’ve got to be people that are self-motivated ... and really put forth the effort and try to go the extra step to make a difference,” Maloney said.